This is a follow up to my initial review of the Opinel No. 7 carbon-steel folding knife. I have been using this knife for about 10 days now. I’ve kept it with me almost constantly throughout this time (except while sleeping and showering) and I’ve tried to use it as much as possible. Here are my impressions. As I noted in my initial review, it took a bit of tuning up before I was happy with this knife. After that initial work though, this knife has been a pleasure to carry and use. I appreciate its lightness, and rarely notice that it is in my pocket. The handle is very comfortable, though I do feel the No. 8 would fit my hand better. The folding mechanism is very smooth. I actually like that it does not have a spring tension lock like the type found on most folders, Swiss Army knives, etc. 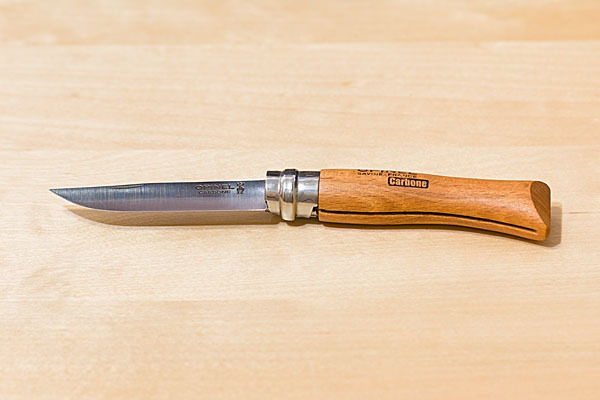 the lack of spring resistance means that the folding action of the Opinel is very smooth — almost effortless. Engaging the fingernail opener slot is sometimes difficult, but almost not necessary. Just disengage the hinge lock, and pull the blade open with your thumb and forefinger. The fastest method of engaging and disengaging the hinge lock is with a quick swipe of the thumb of your knife holding hand. This is fast, but the lock mechanism does tend to dig into the pad of the thumb. On the plus side, I am getting a nice callous on my thumb. I have used the knife to cut just about every material I have encountered over the previous ten days: packing tape, cardboard, envelopes, cheese, bread, pâté, plastic, wood, epoxy, string, etc. Though a bit short, the blade excelled in the kitchen and for simple food prep tasks. I would not hesitate to keep this knife as a permanent addition to my hiking/skiing lunch bag kit. The blade performed very good in wood, doing light carving tasks. It was also great for opening packages, etc. I did find that the blade tends to lose its edge quite quickly. After cutting anything even moderately hard, the edge is noticeable marred and wanting a quick sharpen. The good news is that the carbon-steel is easy to touch up. Plan to keep a small diamond file around if you get an Opinel carbon knife. A dull knife is dangerous as you have to exert more force and therefore increase the likelyhood of slipping. One of the first impressions I had about this knife is that its blade is quite thin and flexible. It has a single bevel grind that goes all the way from the edge to the back of the blade (“full-flat” grind). In use, the blade does not flex as much as I thought it might, but still it would not be the best knife choice for heavier work. 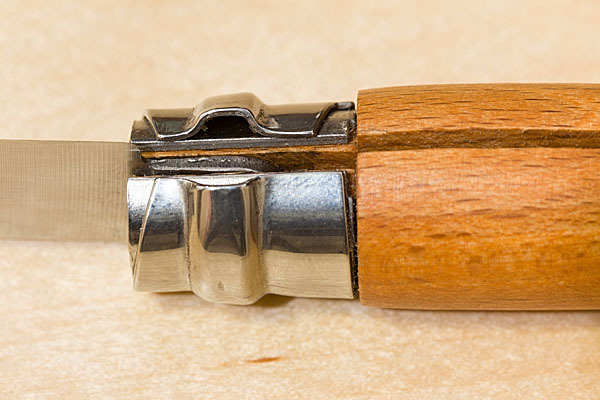 I have a Leatherman and a medium-size Wenger folder that I wouldn’t hesitate to use carving heavy wood, cutting rope, repairing a canoe, etc., but I would avoid using an Opinel in these cases. I’ve been pretty good about cleaning and maintaining the blade over my short usage period with this knife. If I used the knife with food and had to clean it with water, I dried it well and applied a thin coat of olive oil (because that is what sits on our kitchen counter all the time). I have had no problem with rust spots or tarnishing. I am curious to see how the carbon-steel holds up over the long term. Opinel folding knives seem to be a real bargain. The No. 7 is a compact and lightweight folder that would be a good everyday knife. You won‘t even notice it in your pocket, and it will stand up to most typical tasks you will encounter. If you need a serious work knife, consider something else, or try one of the larger Opinel sizes. If you are hard on gear and don‘t feel up to the task of maintaining a carbon-steel blade, then consider getting the Opinel stainless-steel version instead. Summary,A good value folding-knife for everyday light-duty use.